Published: Cambridge, Mass. : Harvard University Press, 2014. Revealed preference speaks volumes. Admittedly, my hardcover version of Capital in the Twenty-First Century was delivered for free by the publisher of this periodical, but the opportunity cost of retaining it was extraordinary last spring when its publisher and distributors remarkably ran out of stock and the market for used copies was surging. I did more than retain it: I also purchased the electronic version so that I could search its contents readily and accurately and fit the 685-pager in a coat pocket. More significantly, I read it, in some places carefully enough to dig into the appendices of its online appendices. The University of Chicagomy alma mater and employeroffered Thomas Piketty a faculty position in 1993, and to our disappointment he turned us down. For several years, Pikettys (and Emmanuel Saezs) inequality estimates have been used for teaching public economics at Chicago, and I have personally benefitted from his tutoring regarding the details therein. The students are hungry for data on inequality and its trends, and it is my privilege to help with the grocery shopping. Capital discusses both national aggregate wealth (parts I and II) and the household distribution or inequality of income and wealth (parts III and IV as well as the introductory and concluding chapters). This review focuses on the latter. Consider first a summary of Capitals inequality analysis in (the official English translation of) Pikettys own words. He begins by asserting that inequality is widely discussed and of interest to everyone. The key question, he says, is to decide whether it is justified, whether there are reasons for it. Otherwise, inequality is an enemy of democracy (pp. 1, 2, 19, 422). Scholars were, before Piketty came along, having an inequality debate without data and had made no significant effort to collect historical data on the dynamics of inequality since Kuznets [in 1955] (p. 31). Instead, economists were churn[ing] out purely theoretical results without even knowing what facts needed to be explained (p. 31). To the detriment of the least well-off, scholars have been refusing to deal with numbers (p. 577). Although Piketty is glad to have multicountry data, he believes that the reader should first consider the French data rather than the American because the French Revolutionthe bourgeois revolution par excellencequickly established an ideal of legal equality in relation to the market (p. 30). The United States is more inegalitarian than Europe and . . . many Americans are proud of the fact (p. 348). As a result, French policymaking tends to be wiser and ahead of its timefor example, its internationally high minimum wage in contrast to the U.S. nominal minimum wages, which get stuck and frozen (pp. 533, 309, 309) during excessively long periods of White House occupancy by Republican presidents. In every country the history of inequality is politicaland chaotic (p. 286). The evolution of inequality is very difficult to explain solely in terms of the supply of and demand for various skills (p. 308). But one lesson comes from all cuts of the data: income inequality has exploded since 1970 or so, with extreme divergence between social groups (pp. 294, 297). This pattern is observed in many countries, but especially in the United States. By now, the inequality problem is enormous and terrifying (p. 572). A market economy based on private property, if left to itself, contains powerful forces of convergence, associated in particular with the diffusion of knowledge and skills; but it also contains powerful forces of divergence, which are potentially threatening to democratic societies and to the values of social justice on which they are based (p. 571). The right solution is a progressive annual tax on capital, and the primary purpose of the capital tax is not to finance the social state but to regulate capitalism (p. 572, 518). Each nation, of course, should implement more progressive policies, but the only real solution must come from a supranational organization or other mechanisms for worldwide taxation. The costs of such a policy can be neglected because such immense inequalities of wealth have little to do with the entrepreneurial spirit and are of no use in promoting growth (p. 572). Although nous mangeons Capital in the 21st Century, we chew the meal carefully. Factual errors are not wholesome, and Capital contains many of them as well as misleading factual omissions. Jeffrey Williamson and Peter Lindert, for example, spent much of their careers putting together estimates of inequality changes over centuries, although they did not compile tax return data as extensively as Piketty has done. Between them, they have written several books and handbook chapters. Williamsons books especially attempt to organize his findings with market equilibrium reasoning (supply and demand). Capital does not even mention any of the Williamson books, however, let alone explain where Williamson erred with supply-and-demand interpretations. Capital is supplemented with an additional bibliography stored on the Internet, but examining it only extended my fools errand by redirecting those interested in the work of Williamson and colleagues to an academic paper in French that also fails to mention a Williamson book. Also before Piketty, other economic historians were working with matched nineteenth-century decennial censuses for the purposes of measuring the dynamics of inequality over the life cycle and across generations. These studies have an important advantage that Pikettys income tax returns do not: the former permit individuals and families to be tracked over time. See, for example, the Chicago dissertations by Joseph Ferrie and Jenny Bourne. Neither of them can be accused of refusing to deal with numbers or of being cited in Capital or its supplemental appendices. When Piketty was still a graduate student, the study of the generational dynamics of inequality was experiencing a data-induced revival among labor economists as some of the longitudinal data sets had been running long enough that the children studied had grown up and formed their own households. Gary Solon published a famous paper with some of those data, and Miles Corak published a book with international versions of that work. My own dissertation, published as Parental Priorities and Economic Inequality (Chicago: University of Chicago Press, 1997), leveraged the same longitudinal data to be the first to look at the generational dynamics of unequal living standards (consumption in economics jargon), which is arguably a better measure of well-being than either income or wealth is. Also omitted from Capital and its supplementary bibliography are results from two distinguished economists named Kevin Murphy. Lawrence F. Katz and Kevin M. Murphy did much of the empirical work documenting the year-to-year dynamics of wage inequality in the postwar United States. Capital never explains where they went wrong in famously concluding that [a] simple supply and demand framework helps illuminate many aspects of changes in the U.S. wage structure (Lawrence F. Katz and Kevin M. Murphy, Changes in Relative Wages, 196387: Supply and Demand Fac- tors, Quarterly Journal of Economics 107, no. 1 [February 1992], p. 76)essentially the opposite of asserting that it is primarily political and chaotic. Kevin J. Murphy, whose career work has examined the data on executive compensation and interpreted results with economic concepts such as incentives and productivity, recently documented several unfortunate consequences of the regulation of bank-executive bonus pay and (with coauthors) concluded that U.S. and non-U.S. CEO pay has largely converged in the 2000s (Nuno Fernandes, Miguel A. Ferreira, Pedro Matos, and Kevin J. Murphy, Are U.S. CEOs Paid More? New International Evidence, Review of Financial Studies 26, no. 2 [February 2013], p. 323). Capital claims the opposite but supplies no evidence for its claim. Several factual errors come with Pikettys claims that France since its revolution has cared more about equal rights and that Republican presidents of the United States have stood in starkest contrast to the French model. He fails to mention that the Polity IV database of political freedoms around the world consistently rates France as less democratic than the United States. There is of course, Napoleon, who gave his country of equal rights the unusual distinction of relegalizing slavery, and Polity IV rates the United States as more democratic in 176 of the 198 years after 1815 and equally democratic in the remaining 22 years. Piketty even fails to know who the president of the United States was at key times that federal minimum-wage legislation was signed (I owe this point to Diana Furchtgott-Roth). Contrary to the quotation from Capital given earlier, President George H. W. Bush, who ranked highly in Republican administrations even prior to his own, wrote, Today I am pleased to sign H.R. 2710, the Fair Labor Standards Amendments of 1989. This law will increase the minimum wage, in two increments (Statement on Signing the Fair Labor Standards Amendments, November 17, 1989, http://www.presidency.ucsb.edu/ws/index.php?pid=17820). The very next Republican president signed yet another minimum-wage law, and his administration said that it supports Senate passage of legislation which increases the minimum wage by $2.10 over two years (Executive Office of the President, Statement of Administration Policy, January 19, 2007, http://georgewbush-whitehouse.archives.gov/omb/legislative/sap/110-1/hr2sap-s.pdf ). These and related inaccuracies do not merely showcase Pikettys amateur status as a surveyor of the economics profession and of Americas position in the world: they go to the heart of Capitals fundamental conclusions about the dynamics of inequality. A couple of key inequality metrics have trended in the opposite direction as those featured in Capital, and Capitals measures are arguably less important. 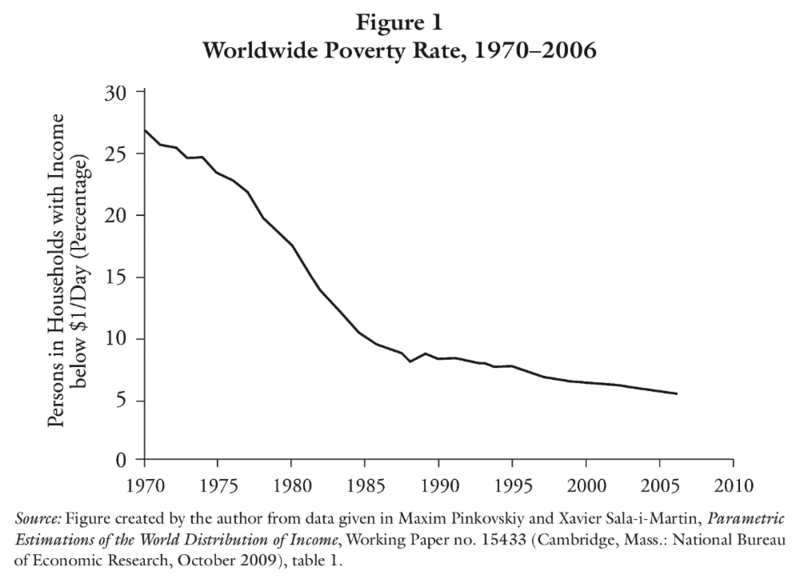 Figure 1 shows the fraction of the worlds population with income below a widely cited poverty line: $1 per day (the results are similar for other poverty lines or other indices of worldwide income inequality). The years featured in figure 1 are exactly those cited by Piketty as the era of increasing income inequality! The major difference is that Capital fails to illustrate the dramatic equalization that has occurred as poor countries have caught up with rich ones. The solid series in figure 2 is a measure of equality in the United Statesthe log differences between the wages of women and the wages of men (log differences are essentially percentages, so, for example, 0.25 means that womens wages are roughly 25 percent less than mens). The more negative the measure, the more womens wages are behind mens and the more unequal the genders are by this measure. As demonstrated in figure 2, at precisely the time that, according to Piketty, income and wage inequality have exploded and in precisely the country where the problem is supposedly the worst, we have two important social groupsmen and womenbecoming more equal after centuries of being substantially less equal. Capital never explains why this dramatic social transformation should be ignored or even downweighted. The tax-return data are not well suited for examining these socially important changes: many of the worlds poor do not file tax returns, and many of Americas working women file an income tax return jointly with their husbands. That is fine by itself: no one type of data needs to address all questions. From the perspective of scholarship, however, Piketty makes a big mistake by baiting his reader with sermons on sordid and abject poverty and then drawing grand conclusions about inequality from such limited data without mentioning these issues to his reader, even while providing a section that purports to admit to the limitations of tax-return data. I suppose Piketty would like to eat his cake and have it too: keep equality trends like those shown in figures 1 and 2 while implementing policies that help to erase the inequality trends shown in Capital. But cooking that dessert will also require ignoring the supply-and-demand findings from the literature. On the whole, worldwide markets have gotten bigger and better. This progress created opportunities for a great many poor in China and India. But it also created opportunities for able people in the developed world to apply their efforts and ideas on a worldwide scale and to earn compensation that is commensurate. That takes us back to Kevin J. Murphys empirical work (see also work by Xavier Gabaix), building on Sherwin Rosens supply-and-demand reasoning that market compensation is greater for workers who have greater responsibilities (e.g., worldwide rather than regional responsibilities). 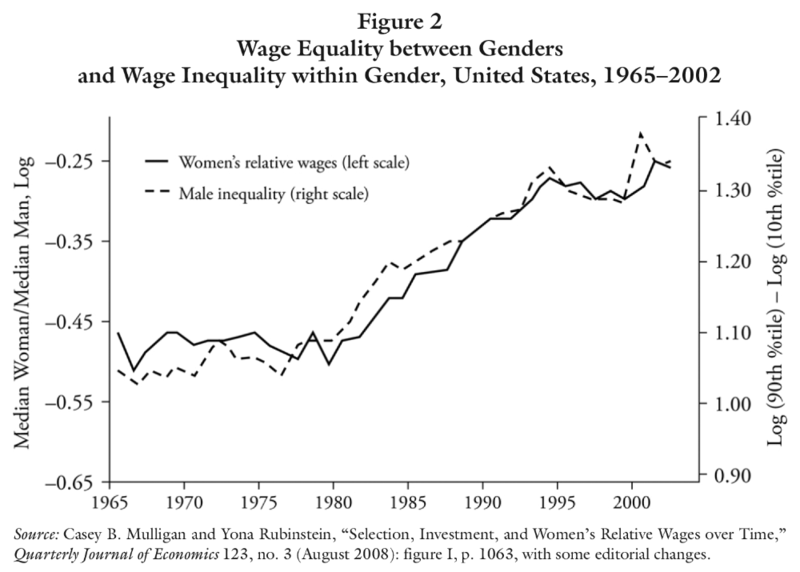 Yona Rubinstein and I showed how much of womens progress (see figure 2) is a consequence of growing wage inequality. We call that inequality the returns to skill. All people have a gender and some amount of skill (and some degree of opportunity to acquire more skill). A problem, you might say, with the America of [Paul Krugmans] childhood (i.e., the 1950s, when Pikettys inequality measures were at their lows) is that the market reward to skill was low in comparison with the market consequences of gender. So women typically stayed home, and men acquired market skills (which were not as valuable as they are today). Then markets improved in scale and efficiency, and skill commanded a new premiummore (within-gender) wage inequality as Piketty would describe itthat began to dwarf the disadvantages (from a market perspective) of female gender. That is why the between-gender equality needs to be shown in the same chart as the within-gender inequality: see the black dashed line in figure 2. It is no accident that the two move together. The premium for skill was a great opportunity for women, and millions of them seized it by entering the workforce and excelling in the top professions. Women are now a majority of new college graduates. A great many women are now, in this era of terrifying inequality, earning more than their husbands. When it comes to tax-return data assembled for the purposes of studying inequality dynamics and public-finance issues, Piketty and his collaborators have the greatest collection to date. Capital in the Twenty-First Century offers its reader numerous interesting tastes of that work, but the tasting is not free. Guests at the Piketty feast are required to go cold turkey from supplydemand reasoning and consideration of unintended consequences and are strictly prohibited from seeing important facts from our world that might be incongruent with the redis- tributionist regimen.